October 17th is the day of Okinawa Soba. A bowl of soba to an Okinawan is what a hamburger is to an American: Everyday fast food. Really? Yep, because that’s the day in 1978 the Japanese Fair Trade Commission decided to admit that the noodles everyone in this prefecture eat on a practically daily basis can be called “Okinawa soba.” Okinawans call “Okinawa soba” as “soba” but in mainland Japan, you can not get or find Okinawa soba as easily as in Okinawa because “Soba” has a different meaning in mainland Japan. There are lots of soba restaurants in mainland, but Japanese soba and Okinawa soba are totally different as ingredients and materials are not the same. If Okinawa is the first stop on a Japan visit, you might consider that soba means Okinawa soba such as white noodles, stodgy soup and pork in the dish, but soba in mainland is thin and the noodles are gray, and the broth is non-fatty without pork. Okinawan people will miss soba when visiting the mainland, even though there are a lot of eateries called soba restaurants in Japan. Why? There is a big difference, and a reason that you can understand easily. Soba in mainland Japan is made with soba buckwheat flour called “Sobako”, but Okinawa soba does not include any buckwheat and is made of flour. Actually, that’s why Okinawa soba is a not kind of a soba under the technical definition. The thick wheat noodles resemble udon, while the soup is more similar to that of ramen. The noodles tend to have a circular cross section in the Yaeyama Islands, and tend to be slightly flat in the rest of the Okinawan archipelago. It is served in a broth flavored with konbu, an edible seaweed, and katsuobushi flakes and pork. Standard toppings are kamaboko fish cake, sliced scallion and a thick slice of stewed san-mai niku pork belly or pork ribs, and usually garnished with pickled ginger. The origin of Okinawa soba is like this; in the Meiji era in Japan, a Chinese cook was invited to Okinawa by a mainland Japanese man, and he opened “Shina soba” restaurant around Naha. 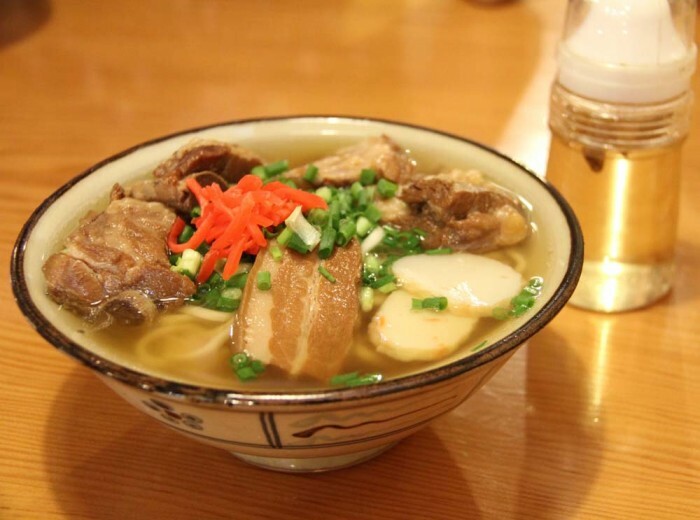 As time went on, it developed to become Okinawan soba. In reality, Okinawa’s soba is more like Ramen in Japan than soba in Japan. Following the reversion of Okinawa to mainland Japan, the organization governing fair trade claims stirred things up because according to their rules Okinawa soba could not be sold as soba because it didn’t use soba buckwheat. The trade people noted soba is defined to include at least 30% buckwheat. Nonetheless, Okinawa has been calling its noodles Okinawa soba, and there were many voices crying out to protect it as soba. After lengthy negotiations, the Japanese government finally agreed to call or write it “Okinawa soba” as a special name, and not only soba. Of course at any restaurant just say soba, or can use “Let’s eat soba!” and that’s fine. And then the day came that Okinawa soba was finally, officially endorsed. On Oct. 17, the Okinawa Soba Day, some celebration events for Okinawa soba will be taking place around Okinawa, and some shops will actually give away free soba on that day. Many soba restaurants prepare original set menus or offer discount services on Okinawa Soba Day, and everyone encourages people to please try to visit and eat Okinawa soba during this week. Seems that over 2,000 restaurants put Okinawa soba on their own menu for this special celebration, and estimates are that 150,000 or 200,000 portions of soba are eaten each day. Almost all tourists to Okinawa try Okinawa soba. It’s one of most popular foods in Okinawa, and almost everyone who lives here has his or her favorite soba joint. There are countless soba restaurants in Okinawa, but none with quite the reputation as Kishimoto Soba, a tiny shack of a restaurant in Motobu that attracts customers in droves. What makes this little restaurant’s soba better than anyone else’s? The “secret ingredient” that’s really not so secret to Okinawans in the know, is tree ash. Hard to believe, but a bit of wood burned to ash, and then ashes soaked to extract a special water, becomes the magic ingredient. Worth the drive to Motobu? Without a doubt. Be forewarned though; you’ll encounter a wait, as the place is always busy. And on top of that, your choices are really simple: order a ‘big bowl’ or a ‘small bowl’ of soba. It’s traditional, and it’s delicious.